Think you know what an Italian Ice is? Think again. Say hello, to the GRANITA. This is the real deal. 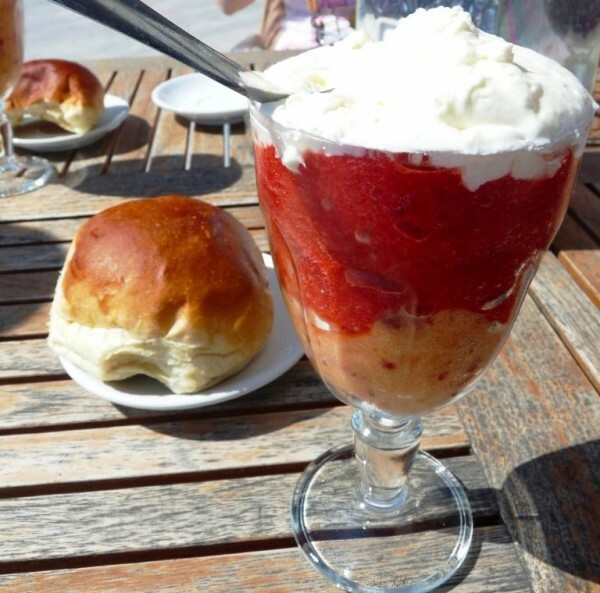 Granita is different than an ice cream or gelato both of which are creamier and heavy. It’s also different from the sorbet, which is more compact. There is an Island in Sicily called Salina, where traditional granita is made since 1968. The best place on the island to find it is called Da Alfredo restaurant in the town of Lingua. Da Alfedo Granita is famous in all of Italy because is not just water and ice with fruit taste … it’s like eating a frozen (Sicilian) fruit, or a delicious flavor such as Pistachio melt in your mouth. Granita in Sicily is very different from the rest of Italy, and is truly home to the best granita in the world. Granita is in a class of its own, distinct and unique, served with a brioche bun the Sicilian way, it’s often consumed for breakfast on a hot day…not a bad way to rise and shine! More than 15 tastes are available at Da Alfredo: melon, strawberry, orange, mulberry, pistachio, chocolate, watermelon, lemon, peach, almond, fig, hazelnut, prickly pears and coffee…the list goes on! You can also order two, or even 3 tastes in 1, with or without crema, similar to whipped cream, but WAY more delicious! Are you thinking to go to Salina? Have a look at the Aeolian Islands Sailing Cruises. Previous: 2012 was a big year for us! Oh my gosh this looks amazing!!!! This was the best breakfast EVER! Granita is made only with fresh ingredients, full power of vitamins & so tasty 🙂 Delicious, enriched by the wonderful location…Definetly everyone should experience and have a taste once!